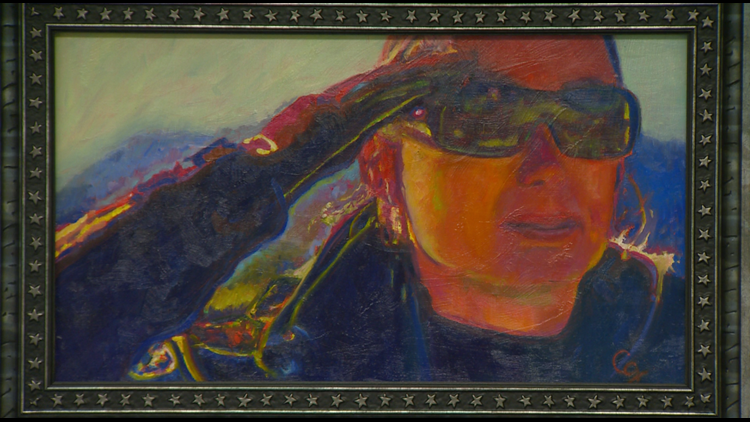 The painting will be auctioned off to raise money for the Colorado Fallen Hero Foundation. The layers of Charlene Goldman’s paintings include lines, shape, color and texture. But underneath every painting are the words you can’t see. The ones she paints to stick to the message she wants the art to convey. Every painting always has the layer of love. She even carved the word into her easel. “It’s all about love, that is the painting,” she said staring at her canvas late one night. 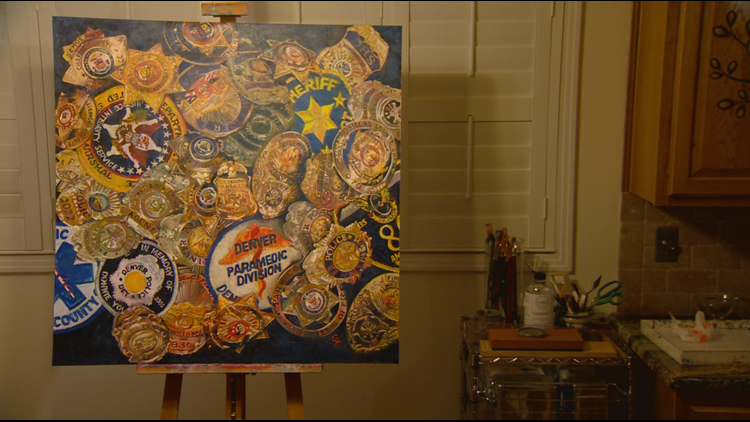 The canvas she’s laboring over is covered with badges borrowed from Colorado first responders. 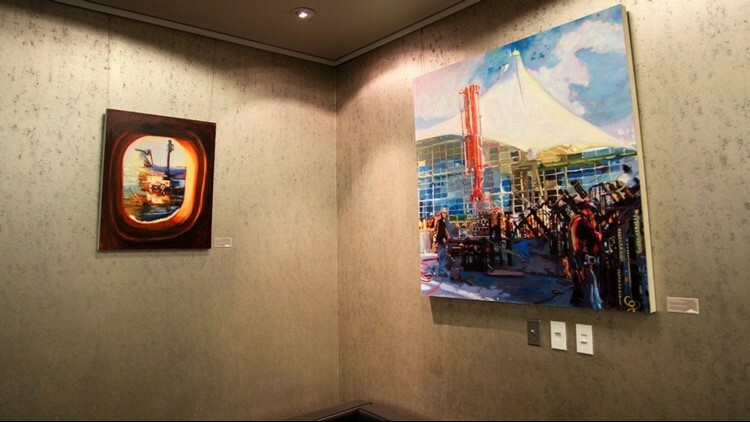 It’s different from her abstract work, like the paintings the Denver International Airport commissioned her to do. Painting the badges takes meticulous strokes. Although this painting is unlike anything she’s ever done, it begins like the rest: with love. Charlene never planned to fall for a police officer. Mark never planned to fall for an artist. She saw beauty where he saw routine. “I was the 86th person hired in 1982,” Dunahue explained of the numbers on his badge. Goldman sees art even on days when beauty is tough to see, like the day Douglas County Deputy Zack Parrish gave his life on the job. 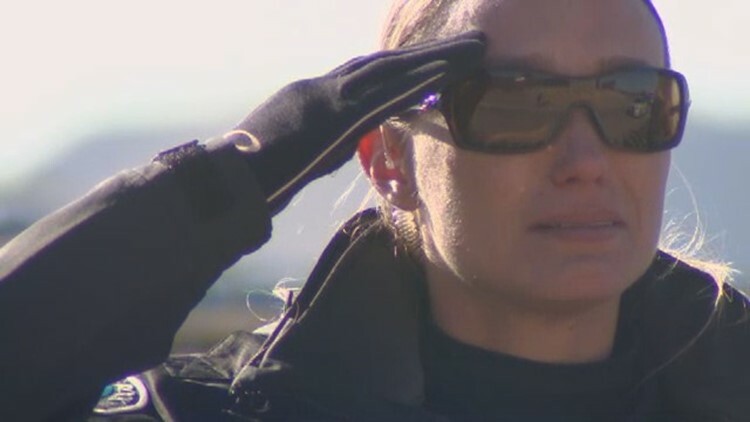 She saw the face of a Castle Rock police officer standing along the procession route and felt compelled to paint it. “I think the newscast and the pictures really struck me and hit me hard just because it could be him, it could be any of them,” Goldman said. Dunahue knows the expression well. “Trying to stand at attention, trying to hold salute, with tears coming down but still trying to maintain that stoic look,” Dunahue said. It still comes back even two decades after he lost his close friend, Denver Police Officer Bruce Vander Jagt. The painting of the badges is for them, to raise money for the families left behind. It will be auctioned off for the Colorado Fallen Hero Foundation on May 21 during a charity golf tournament that is already sold out. There is more than one layer of love in Charlene’s painting. The love of art itself. Love of the man who inspired it and a love for the person behind every badge.